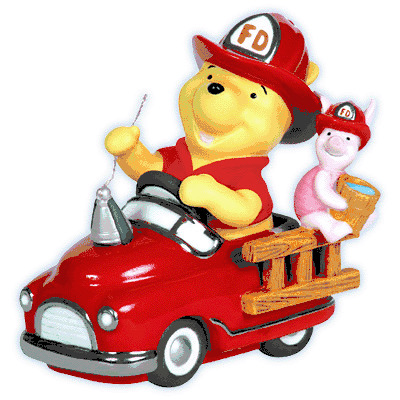 Precious Moments Disney Pooh "I'm Always By Your Side"
Pooh and Piglet come racing to the rescue aboard their shiny red fire engine. The daring duo make a delightful way to show someone you are always there for them. Bisque porcelain figurine. 4 " H. Disney Showcase Collection. Item#: 113702 - Height: 4 "
No Sales Tax Except In The State New Jersey, All Brands are Trademarks of their Respective Holders. Retail price is Manufacturer's Suggested Retail Price and may not reflect actual selling prices. We reserve the right to change prices as they do change often by the companies. We reserve the right to correct at all times any typographical error. Some images are enlarged to show details. Copyright � Crystal Palace Corp.- � Crystalpalacenj.com All rights reserved. All trademarks and brands are the property of their respective owners. Copyright 2017-2018 Crystal Palace Corp. - Crystalpalacenj.com All rights reserved.All trademarks and brands are the property of their respective owners.